For a wedding gift my sweet Aunt L gave us the Artisan Bread in Five Minutes a Day book. It looks beautiful and…well, intimidating. I didn’t feel like it was approachable – I have since corrected the ERROR OF MY WAYS!! This book shows you how to make this MOUND of dough in, like, 5 minutes. It took longer to find the stupid liquid measuring cup than it took to put the dough together. You turn the tap on and when it’s warm to the touch you put three cups into a mixing bowl. You add 1 1/2 T (remember – BIG T = Tablespoon, little t = teaspoon) of yeast to the bowl and 1 1/2 T of Salt too. Then you STIR in 6 1/2 cups of flour. NO KNEADING. Stir that bad boy together, cover with either plastic wrap or a kitchen towel, then – get this – you walk away. WALK. AWAY. Come back in 2-5 hours and mold the bread (nice pun!) into whatever shape/shapes you want (today I used 1/2 the dough to make 2 baguette shapes). You leave that to rest a 2d time and go heat the oven up. Whatever dough you’re not using today you can refrigerate for up to 14 days. I usually dump 1/2 in a gallon sized ziploc and squeeze out the air bubbles and throw it in the fridge. Just remember to let it come to room temp before allowing it to rise the 2d time (about 30min on the counter usually does the trick). Oh, and the pan on the bottom rack? That’s to make steam. Once the bread is on the baking surface you’ll dump a cup of water onto the lower pan to create steam – just remember to shut the oven door QUICK to trap in the steam. This makes a lovely crackly crust = happy me/husband. I made it this afternoon while the babies were ‘napping’. Seriously, why are they deciding that NOW is a good time to give up nap #2?? Sheesh. So I stirred together the no-knead dough this morning and left it alone for hours and hours. When I had a chance this afternoon I rolled/pulled/stretched 1/2 the dough out into 2 baguette-wanna-be logs and baked them off. I think there’s something wrong with our oven because the recipe said to bake the loaves for 24-28 minutes, and this bread needed an additional 10 minutes to get to the golden-y delicious/hollow-sounding stage. 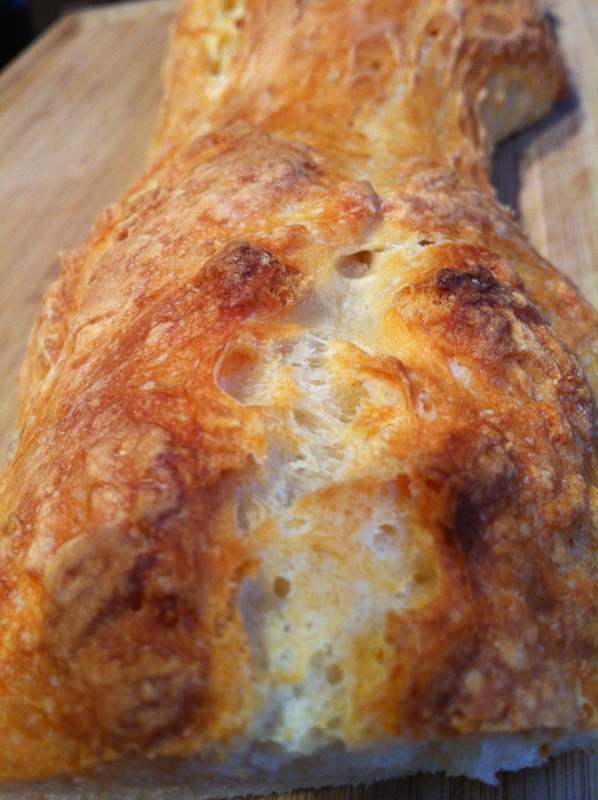 Seriously, doesn’t this bread – or any homemade bread, really – make you wanna sing out loud!?!? 1 Tablespoon granulated yeast ( you can use any kind of yeast including: instant, rapid rise, bread machine, active dry or cake yeast. If you use cake yeast you will need 1.3 ounces). 1 to 1 1/2 Tablespoons Morton’s Kosher Salt (adjust to suit your taste or eliminate it all together. Find more information here.) **I used regular table salt. 1- In a 5 or 6 quart bowl or lidded Food Storage Container, dump in the water and add the yeast and salt. Because we are mixing in the flour so quickly it doesn’t matter that the salt and yeast are thrown in together. **I used a regular old mixing bowl and have consistently had good results. But then again, I’m lazy and don’t feel like finding a lidded food storage container…. 2- Dump in the flour all at once and stir with a long handled wooden spoon or a Danish Dough Whisk, which is one of the tools that makes the job so much easier! 3- Stir it until all of the flour is incorporated into the dough, as you can see it will be a wet rough dough. 4- Put the lid on the container, but do not snap it shut. You want the gases from the yeast to escape. 5- Allow the dough to sit at room temperature for about 2 hours to rise. When you first mix the dough it will not occupy much of the container. 6- But, after the initial 2 hour rise it will pretty much fill it. (If you have decreased the yeast you will have to let it go longer than 2 hours.) DO NOT PUNCH DOWN THE DOUGH! Just let it settle by itself. 7- The dough will be flat on the top and some of the bubbles may even appear to be popping. (If you intend to refrigerate the dough after this stage it can be placed in the refrigerator even if the dough is not perfectly flat. The yeast will continue to work even in the refrigerator.) The dough can be used right after the initial 2 hour rise, but it is much easier to handle when it is chilled. It is intended for refrigeration and use over the next two weeks, ready for you anytime. The flavor will deepen over that time, developing sourdough characteristics. 8- The next day when you pull the dough out of the refrigerator you will notice that it has collapsed and this is totally normal for our dough. It will never rise up again in the container. 9- Dust the surface of the dough with a little flour, just enough to prevent it from sticking to your hands when you reach in to pull a piece out. 12- Let the dough rest for at least 40 minutes, (although letting it go 60 or even 90 minutes will give you a more open hole structure in the interior of the loaf. This may also improve the look of your loaf and prevent it from splitting on the bottom. ) You will notice that the loaf does not rise much during this rest, in fact it may just spread sideways, this is normal for our dough. 15- Slide the loaf into the oven onto the preheated stone and add a cup of hot water to the broiler tray. Bake the bread for 30-35 minutes or until a deep brown color. As the bread bakes you should notice a nice oven spring in the dough. This is where the dough rises. 16- If you used parchment paper you will want to remove it after about 20-25 minutes to crisp up the bottom crust. Continue baking the loaf directly on the stone for the last 5-10 minutes. 17- Allow the loaf to cool on a rack until it is room temperature. If you cut into a loaf before it is cooled you will have a tough crust and a gummy interior. It is hard to wait, but you will be happy you did! Make sure you have a nice sharp Bread Knife that will not crush the bread as you cut. Or you can tear it apart as they do in most of Europe. 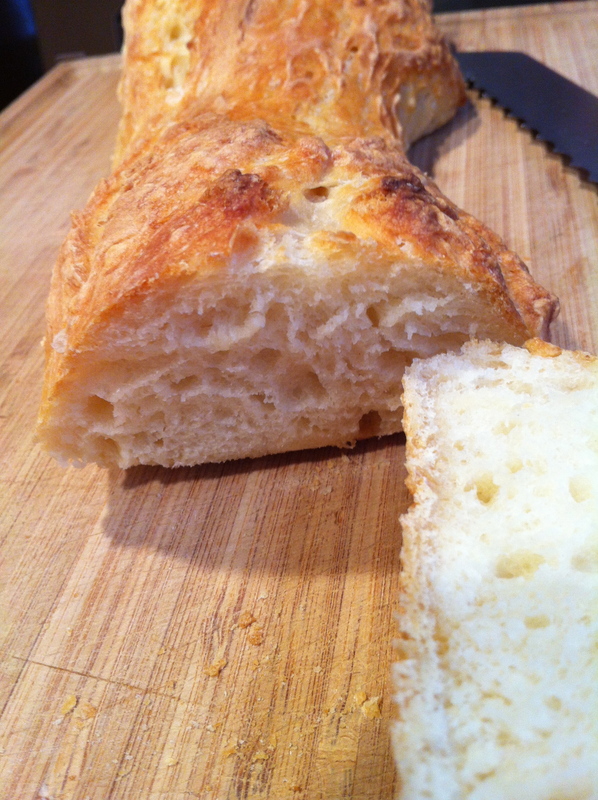 A similar recipe that I’ve also used *A LOT* is from Mel’s Kitchen Cafe: Rustic Crusty Bread. Even the name of it makes me wanna grab this bread, a hunk of cheese, a bottle of wine, and a pound of grapes and then go find a French River to sit next to…. BTW, both websites offer lovely step-by-step pictures.